Newest Soft Fitbit Alta HR Band / Alta Band for Fitbit Alta 2016/Alta HR 2017 Fitness Tracker, Personalized Your Fitbit every day, fit with your daily wear and mood! Compatibility Type: Fit for Fitbit alta hr 2017/ Fitbit Alta fitness tracker 2016, Not fit for any other fitbit tracker. Material Type: AK Fitbit Alta hr bands made of TPU (Thermo plastic polyurethanes ) feels very comfortable - this Fitbit Alta hr bands with Secure Metal Buckle is durable and long lasting, available for men, women when sport, dating, meeting etc. Metal Clasp Type: Alta hr bands with metal Secure Buckle, keep your fitbit stay in place firmly. NO WORRY MISSING your fit-bit Alta hr/ fitbit alta. 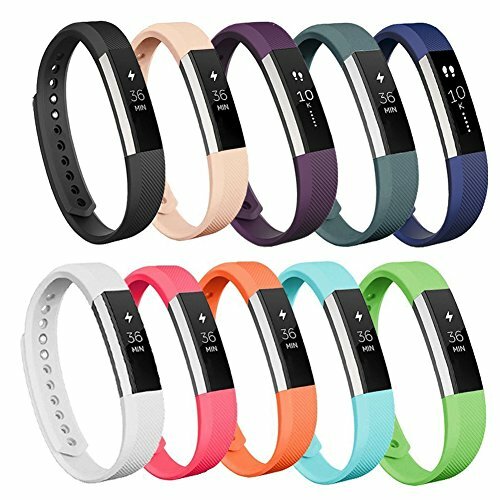 Color Option: More color choices than original Fitbit Alta HR Band Black, White, Plum, Coral, Lavender, Grey, Blush pink, Teal, Brown, Navy Blue 10 colors Fitbit Alta HR Band Wristband replacement for you to choose, fit with your daily wear and mood. Warranty: 90 Days Money Back Guaranteed! Please feel free to contact us if you meet any question. We will try our best to solve your problem. If you have any questions about this product by AK, contact us by completing and submitting the form below. If you are looking for a specif part number, please include it with your message.